The report also noted that about 30 chemicals or chemical categories appear to be commonly used in nail products, including: toluene, formaldehyde, dibutyl phthalate, methyl ethyl ketone, ethyl acetate, butyl acetate, acetone, acetonitrile, ethyl methacrylate, isopropyl acetate, methacrylic acid, methyl methacrylate (banned in many states), and quaternary ammonium compounds in disinfectants. The risk of experiencing these health effects depends on a variety of factors, including the nature of the exposure and individual susceptibility. Employees and customers may be exposed to chemicals by inhaling vapors or dust, through vapor contact with eyes and mucous membranes, or via direct skin contact with the nail products. Federal OSHA Requirement that all US nail salons must provide a work environment that is free from sensory irritation. 46 states currently follow these codes; 4 follow International Building Code. It’s important to check with your state boards to get updated code information regarding ventilation as guidelines and timetables vary from state-to-state. Some codes are currently just applying to new construction or openings, however some include all nail salons. Each manicure & pedicure station must have a source capture system. The inlets must be within 12" from the application area and must be capable of extracting air at 50 CFM (cubic feet per minute). The exhaust from the source capture system must be vented outside. Source capture systems must operate continuously during occupancy. In April, U.S. Sen. Kamala Harris, D-Ca, and Nevada Democratic Senator Catherine Cortez Masto introduced The Environmental Justice Right to Know Act for discussion. When connected to an external HVAC system, toxins and odors are vented outside of the building. 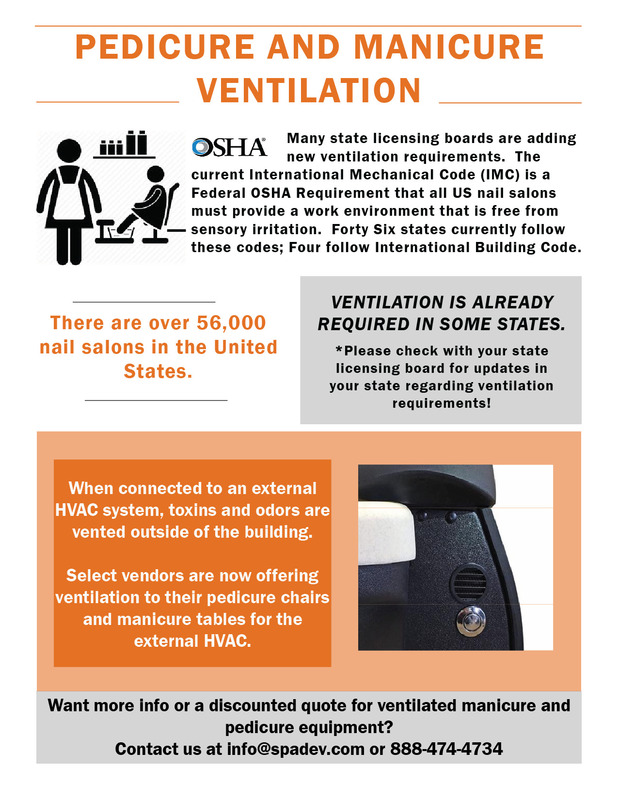 Select vendors are now offering ventilation to their pedicure chairs and manicure tables for the external HVAC. Some vendors are providing options with manicure/pedicure carbon filters built into the chairs and tables. We are a woman owned business with over 30 years of combined experience in the spa and salon industry. We focus on keeping a healthy work-life balance to ensure that we can focus 100% on our customers!